His Hands Reader - Helping deaf and hearing in developing countries to read so they can read His Word. An estimated fifty million (50,000,000) deaf in the world can not read. His Hands Reader (HHR) project enables hearing and deaf volunteers in developing countries to make a video dictionary and reading primers using their own text language and hand signs. These videos aid in learning to read English, the local business language and local native language with hand sign assist. 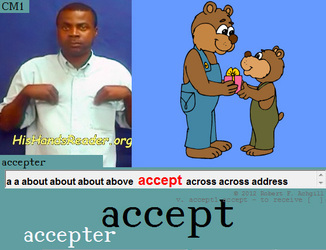 See how you can volunteer to add your hand signs or text language -- go to the tab My HHR. It only takes 24 hours of your time. Also, HHR helps hearing family members learn basic hand signs so they can communicate better with their loved one. Having a video dictionary of hand signs is the first step in helping deaf persons to learn to read and family members of deaf to learn to use hand signs. The His Hands Reader project makes it easy to make a high quality video dictionary for any sign language for no cost. Every sign language is welcome! Q: What are the two things that will help women in developing countries the most? Q: How many in the world today beyond reading age can not read? "Does your country have a sign language dictionary?"